Since the end of the Cold War, Japan's security environment has changed significantly. While, on the global level, the United States is still Japan's most important security partner, the nature of the partnership has changed as a result of shifting demands from the United States, new international challenges such as the North Korean nuclear programme and the rapid rise of China. At the same time, Japan has been confronted with new, ‘non-traditional’ security threats such as international terrorism, the spread of infectious diseases, and global environmental problems. On the domestic level, demographic change, labour migration, economic decline, workplace insecurity, and a weakening impact of policy initiatives challenge the sustainability of the lifestyle of many Japanese and have led to a heightened sense of insecurity among the Japanese public. This book focuses on the domestic discourse on insecurity in Japan and goes beyond military security. The chapters cover issues such as Japan’s growing perception of regional and global insecurity; the changing role of military forces; the perceived risk of Chinese foreign investment; societal, cultural and labour insecurity and how it is affected by demographic changes and migration; as well as food insecurity and its challenges to health and public policy. Each chapter asks how the Japanese public perceives these insecurities; how these perceptions influence the public discourse, the main stakeholders of this discourse, and how this affects state-society relations and government policies. 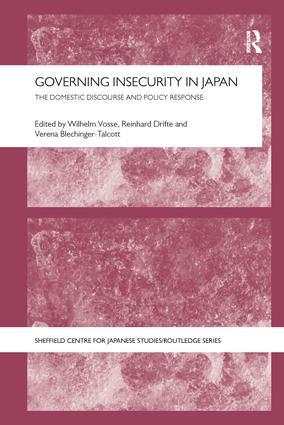 Governing Insecurity in Japan provides new insights into Japanese and international discourses on security and insecurity, and the ways in which security is conceptualized in Japan. As such, it will be of interest to students and scholars working on Japanese politics, security studies and international relations.